Artist Ruben Aguirre of Chicago adds his vision to a Sierra Mist® billboard created exclusively for Chicago on September 17, 2014 in Chicago, Illinois. Aguirre was the fourth artist to collaborate on the co-created billboard, which will be finalized by one additional Chicago artist and placed in 15 locations throughout the city. You’re invited to attend a very cool, free closing party for the re-launch of Pepsico’s Sierra Mist brand. Tonight, Friday, September 19, from 6 to 10 pm, at Open Secret Studios, 401 Racine Ave. , enjoy gorgeous lemon-lime-lit atmosphere, beautiful art, delicious food, and funky-cool music – and it’s all free. 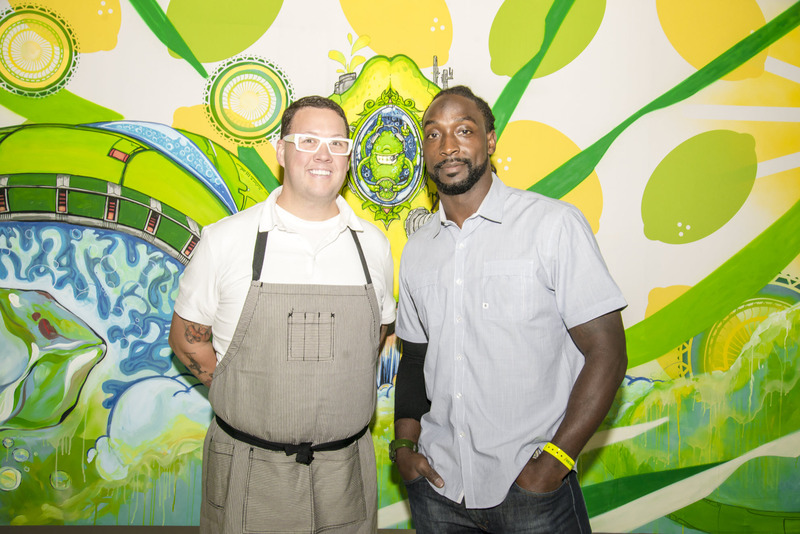 During the preview, sports giant Charles Tillman shared his passion for the arts and his thoughts on the project. Graham Elliot prepared and served dishes inspired by the soda and by the billboard, while DJ Arkitek (from Studio Paris, theMID, UNDERGROUND, etc.) cranked the beats. As part of EXPO Chicago, the Sierra Mist collaboration (#sierramistcollab) project features five Chicago artists (Samantha de Carlo, James Whitworth, Tony Bramble, Ruben Aguirre and Justus Roe), who each have added their unique artistic expression to the same canvas during a five-day span. The final product is a billboard you can preview at the party tonight – and that you’ll soon see throughout Chicago. Chef Elliot will serve his inspired food and drinks. Check out this exclusive interview with Chef Graham Elliot about the #sierramistcollab.